Dragon Naturally Speaking Medical Software is highly useful for Doctors who are very busy and do not have the time to prepare notes and reports by hand. This software has been awarded immensely for its work. It aids a doctor by recognizing his voice and converting the speech into notes on the computer. By using this software, a doctor saves a lot of time, and can divert his time to attending more patients and saving more lives. Dragon Naturally Speaking Medical Software can also keep an update on every health record, which is accessible from anywhere. The doctor can use this while operating on a patient, while on consultation with a patient, or from any other station. 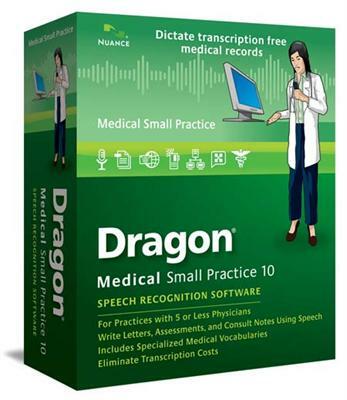 Dragon Naturally Speaking Medical Software is compatible and recognizes a wide range of accents. It just needs to be trained in that particular doctor's voice and it understands that accent and records accurately from then on. Dragon Naturally Speaking Medical Software software is like a boon to the medical world. Did you know that this software records voices faster than you can type? Dragon Naturally Speaking Medical Software is almost three times faster than an average person's typing speed. Thus, a doctor can spend more quality time dealing with the patient's problems. This speech recognition software is a lot more accurate than typing. Dragon Naturally Speaking Medical Software is known for more than 99% accuracy. Custom vocabularies can be built on any topic and higher accuracy levels can be achieved. So, any doctor according to his/her specialization can build vocabularies and all the complicated medical terms can be recorded in no time. The installation procedure is very simple. Your software can be loaded from the CD in a few minutes time, and it is ready to use. You can dictate letters, surf the web, and send emails etc accurately. The software also comes with a noise reducing microphone. Dragon naturally Speaking Speech recognition software is very versatile. It can be loaded on to a range of programs that are commonly used. It can be accessed through the organizations network. So, the doctor can use this from any computer in the organization. Some of these can be imported on to any mobile recorder. Thus, allowing a third party to edit quickly and without any effort. Dragon Naturally Speaking Medical Software software is section 508 certified to assist specially challenged people a hands free use of the computer. This tool is ideal for people with carpal tunnel syndrome and repetitive stress traumas. Dragon Naturally Speaking Medical Software is a onetime investment that saves effort on documentation. The time you usually lose in filing and retracting files manually is saved. The cost of paper is also reduced. As the doctors get more time to attend to more number of patients, this speech recognition software supports more space for additional data. With its greater memory, it records faster, and has an unbelievable response time. You would be surprised to know that the Dragon Naturally Speaking Medical Software is capable of doing more than we have already talked about. It boasts of the additional features like Hidden mode, Medical vocabularies, Medical formatting rules, EHR support, Supports HIPPA regulations, and microphone compatibility. The PC requirements are minimal and this software is supported on almost all basic computers. Dragon naturally Speaking Speech recognition software has won over 175 awards worldwide. Dragon Naturally Speaking Medical Software's popularity is growing leaps and bounds, as is the number of doctors that are using it.